On 26 May, Egypt conducted six airstrikes against targets in Derna, supposedly in retaliation for the massacre of 28 Coptic Christians in Egypt’s Minya province the same day. The attack was claimed by ISIS. Further airstrikes were launched on 29 May. Targets included the city’s power station and the electricity distribution network. Egyptian President Abdel Fattah el-Sisi said the air strikes in Derna had targeted fighters responsible for plotting the Minya attack, and that Egypt would not hesitate to carry out additional strikes inside and outside the country. However, Derna is controlled by the Derna Mujahedeen Shura Council (DMSC) which fought against ISIS. 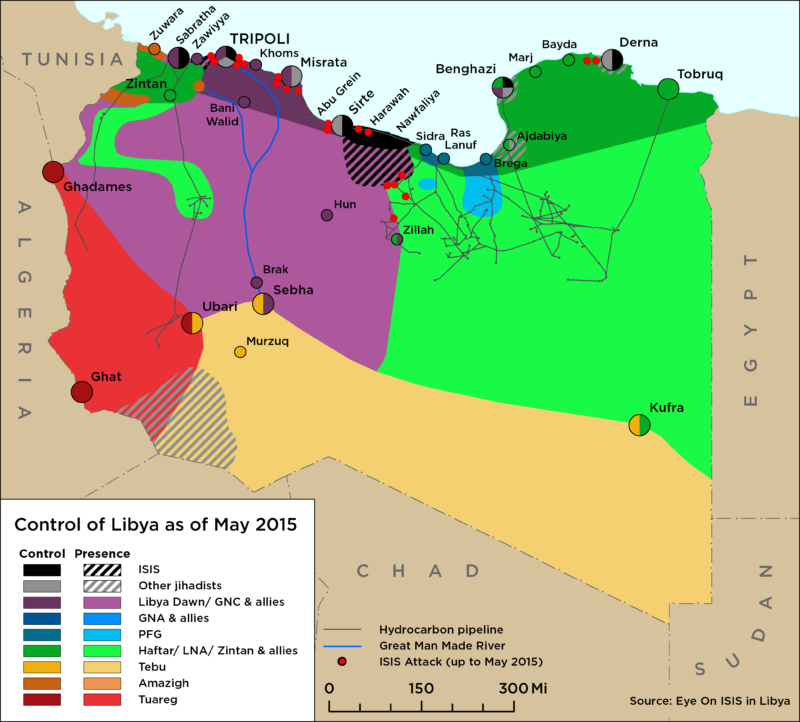 ISIS was driven out of Derna two years ago. 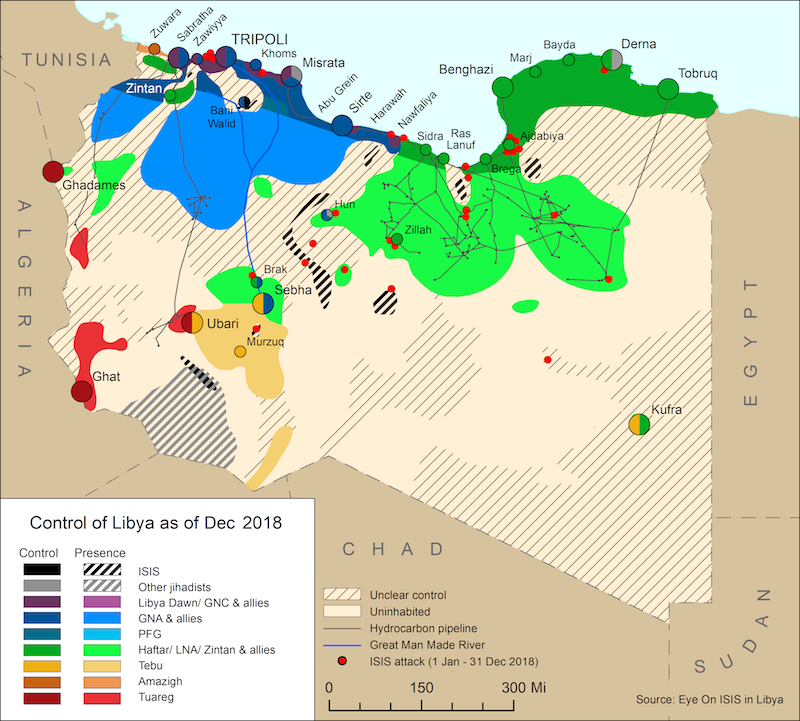 On 28 May, the spokesperson for Haftar’s Libyan National Army (LNA) Colonel Ahmed Mesmari said that the LNA was coordinating with Egypt’s military over the air strikes. The Libyan House of Representatives (HoR) praised the Egyptian airstrikes on Derna, while the Government of National Accord (GNA) condemned them as a gross violation of Libya’ sovereignty. During a press conference in Cairo on 29 May, Egyptian foreign minister Sameh Shoukry said jihadist training camps in Libya were a huge threat to Egypt and that Egypt had targeted the bases of these organizations in full coordination with the LNA. The Russian foreign minister Sergei Lavrov was also at the press conference. On 27 May, the Egyptian air force and the LNA also conducted joint airstrikes on Jufra, bombing positions held by the Misratan Third Force and local militias allied with Benghazi Defence Brigade (BDB). The LNA’s air force said that the strikes targeted Jufra airbase and an ammunition store in Hun. Local officials in Hun said the strikes had also cut electricity to a number of neighbourhoods and had destroyed a number of civilian, non-military buildings.